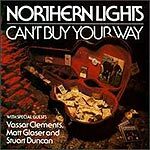 CD review: "Can't Buy Your Way"
Part of the burgeoning "newgrass" movement in country music (Ricky Skaggs was an early member of this movement), Northern Lights is a tight, imaginative combo with a fresh sound that still captures a sense of tradition. The group runs through a set of neotraditional bluegrass originals and off-the-wall covers that, as the band's own liner notes put it, "translate so well to bluegrass." Among the unexpected offerings are the Eagles' "Heartache Tonight," James Taylor's "Lighthouse," and "Anger and Tears" by the Amazing Rhythm Aces. Besides great vocal harmonies, Northern Lights also features excellent picking on a funky, well-balanced set of instruments: mandolin, guitar, bass and banjo. Listening to these guys chase each other through solos and back each other on vocals is about as much fun as bluegrass gets.